The Active Leisure Centre Sports Camp is an opportunity for primary school aged children to particate in a variety of sports based activites during the school holidays in a fun, safe and positive environment while being coached by our qualified staff. The program is a safe and fun place for your children to be during the holiday break. Your children will make new friends, enjoy sports that include: Soccer, Basketball, Tennis, Squash, Badminton, Netball, Volleyball, Cricket, Touch Football, Hockey, Team games and Activities. Includes swimming daily. Most importantly, they will have a great time with the help of the Active Leisure Centre Sports Camp Staff. The coordinator and leaders all have first aid qualifications, WWVP and experience with the supervision of children. If you're interested in our Sports Camp, then please download and fill in our School Holiday Program Enrolment Form or contact SPORTS CAMP. Also check out our School Holiday Program Brochure for more details. The Sports Camp is conducted between the hours of 8.00am and 6.00pm and is available during all ACT public school holidays (excludes public holidays and some days around Christmas and New Year). We cater to all children between the ages of 6 and 12 years (children must have started school). Active Leisure Centre Sports Camp is happy to accept payments in cash, cheque or credit card. For your convenience payments may be made at any time throughout our extensive opening hours. Please note payment is required at the time of booking. Unfortunately, places cannot be held without full payment. 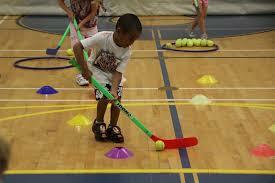 Our program incorporates a variety of sports. Children are divided into groups based on their age and the number of children attending. On arrival free time is offered, giving children free play with equipment provided. At 8.00 am we run small get to know you games allowing children to make new friends. At 9.00am the day’s activities begin. Below is a sample program. Please note it is only a guide. Activities may vary according to availability of centre facilities and program numbers.